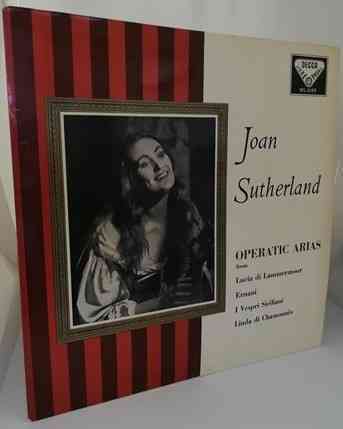 33rpm LP Record of SXL 2159 Joan Sutherland OPERATIC ARIAS from Lucia di Lammermoor, Ernani, I Vespri Siciliani, Linda di Chamounix, with the Paris Conservatoire Orchestra conducted by Nello Santi. 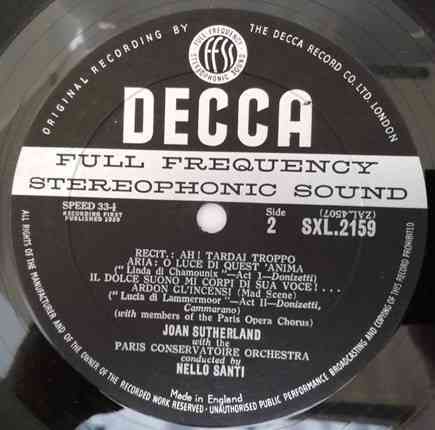 It was issued on the Stereo DECCA wideband grooved label ('Original Recording By' - ED1) in 1959. UK pressing. Flipback sleeve. The record itself is graded at least excellent, with no more than the odd light surface mark visible when viewed under normal house lighting. Play-tested on a USB turntable. Superb sound quality with no jumps, repetitive ticks, pops or crackle. Stunning playback for a record that is 60 years old! The outer sleeve is graded a bit less than excellent, with no more than light handling and storage wear. The brown 'patch' in image 2 above is not age toning but the shadow caused whilst taking the photo. The thin spine is intact and strong. 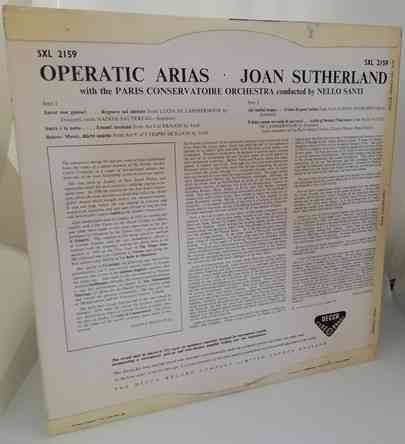 The inner sleeve has no wear to speak of.